The RS01 wants to be the best shirt in your closet- one that can protect you as much as it looks good. Designed with the bicycle commuter in mind, the RS01 by Ravelin is a reflective safety garment – that doubles as your favorite shirt to wear to work. Its sleek design looks great in the office without showing the integrated reflective pattern than illuminates during your commute home, making for a valuable transitional garment that takes the urban dweller from day to night. With clean lines and a simplistic design, the RS01 comes in the classic Shepherd’s Check pattern. But the shirt’s fabric is more than meets the eye, with a specially developed fabric that is as safe as it is stylish. Interwoven into the custom fabric is a retroreflective pattern of a light grid that illuminates when hit with oncoming headlights. Other safety garments are made with reflective coatings that rest on the surface of the fabric- meaning they can crack and wear over time. But RS01’s reflective elements are woven directly into the fabric, allowing it to move, bend and stretch without damaging its safety properties. In addition to the innovative reflective features, the RS01 has other features created for the cyclist. Inside the shirt’s construction are wind blocking panels, which block out cold air and siphon away heat from sweat-prone areas like the back, armpits and sleeves. The shirt also comes with a unique rear pocket, that snugly and comfortably holds your phone out of harm’s way- and dips lower to prevent it from untucking during riding. The cyclist’s dream shirt is currently available from their Kickstarter campaign, giving commuters a chance to grab their own RS01 shirt before it hits the market. The RS01 wants to be the best shirt in your closet- one that can protect you as much as it looks good. Designed with the bicycle commuter in mind, the RS01 by Ravelin is a reflective safety garment - that doubles as your favorite shirt to wear to work. 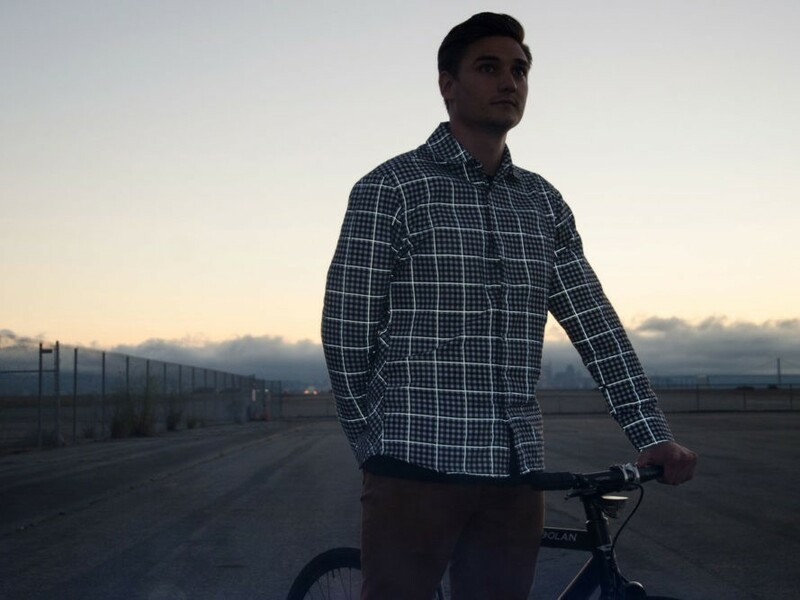 Its sleek design looks great in the office without showing the integrated reflective pattern than illuminates during your commute home, making for a valuable transitional garment that takes the urban dweller from day to night.